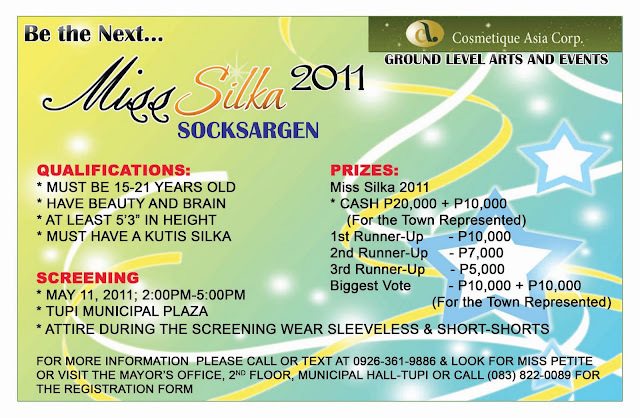 The search for young, beautiful, and smooth-skinned teenagers is coming to Tupi, South Cotabato this May 11 for Miss Silka 2011 Socsksargen screening. Check out the poster below. You may also register through text type Name, Age, Address and send to 09263619886. Presentation of candidates will be on May 21, 2011 3pm at the Gaisano Mall of Gensan Atrium. Talent and Swimwear Competition will be at A Montana Resort (formerly Isla Parilla) on May 28, 2011 2pm. The Gown Competition and the Grand Coronation will be on June 11, 2011 2pm at the KCC Mall Convention and Event Center. If you think you got the looks plus that kutis silka, don't forget the above mentioned dates and be there! 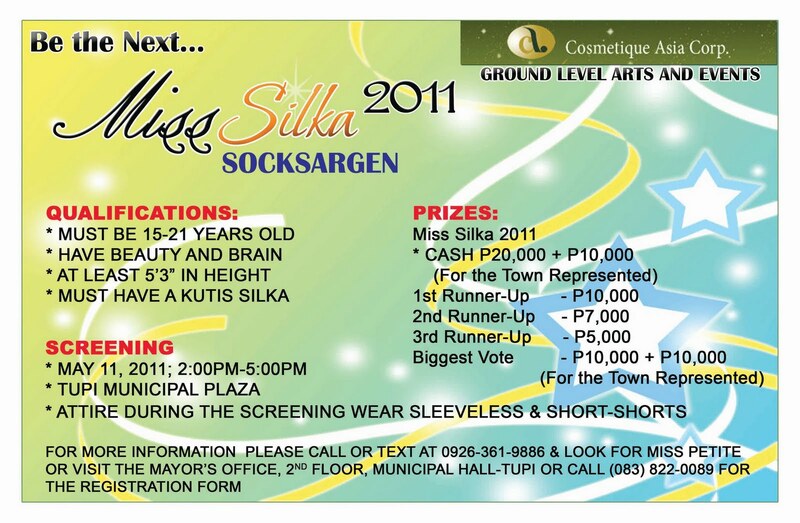 You might be the one to represent the region in the national Miss Silka 2011 Pageant. Fabulous prizes plus expensive exposures awaits the ultimate winner and a chance to be partnered with Silka endorsers Iya Villania and Erich Gonzales for the branding of Cosmetique Asia Corp.